Kodak has announced two latest PIXPRO SMART LENS cameras during CES 2014, including SMART LENS SL10 and SL25. If you’re curious, let’s go on checking what features have been equipped in the smart cameras. The PIXPRO LENS camera is Kodak’s brand-new lens-style compact camera line that contains two models at present including SMART LENS SL10 and SL25. 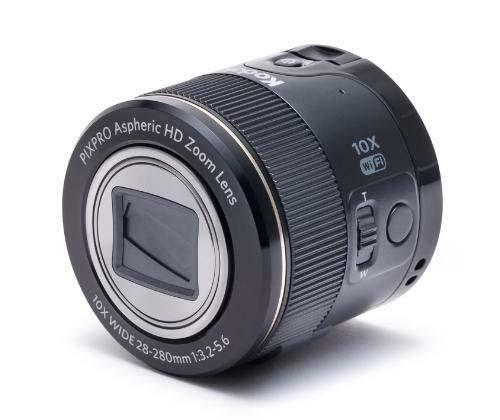 As we can see from the image, the smart camera features ultra compact lens-style design and is able to attach onto your iOS or Android phone and turn the smartphone into a professional smart camera. The SMART LENS SL10 features 10x optical zoom, 1080p video, 28-280mm wide angle lens and OIS (optical image stabilization), while the SL25 sports 25x optical zoom and a 24mm wide angle lens. SMART LENS SL10 smart camera is priced at $199 USD, the SL25 model costs $299 USD. Both models will be available in spring this year. If you’re interested, jump to Kodak official site for more details.